This hillside complex overlooks the Tesuque River Valley and the broad range of Sangre de Cristo Mountains in the distance. 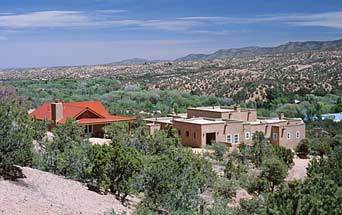 The 4,000 square foot Main House is designed in the northern New Mexican Territorial style. The central grand Sala opens out to the east facing portal and internally to the exhibition spaces for the couple's extensive folk art collection. This open plan provides opportunities for social gatherings throughout the year. The rustic 2 bedroom Guest house perched above the main drive provides an intimate setting for visiting friends and family.